Do we choose new terrain? Or should we stick to familiar territory? For new destination, we were thinking about starting in Louiseville and riding north & east towards Shawinigan. We are exploring the north shore of the Saint Laurence river as part of one of our ten-year plans. This particular area looks quite good. it's called the MRC de Mackinongé. (a MRC is a bit like a county). Where is it? It's just this side of Trois Rivieres. Just after Lanaudiere. Louiseville is the first town you hit as you drive along the 40. 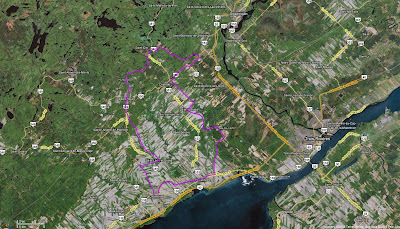 We would ride from the st-laurence lowlands up and in to the Laurentian/Canadian shield highlands. A little known factis that Quebec north of the St-Laurence is very lightly populated. So, be careful you don't get your carbon bike frame eaten by beavers while you snooze at the lunch stop. We have a Carte Vélo of this region, and we linked together two bike rides into a larger loop. The downside? Our cameria is broken, and we can't take pictures. On the plus side, this means our average speed will be 1-2 km/h better. Here's the bikely map I made for this potential ride.